The 33-year-old is likely to move on in the summer. 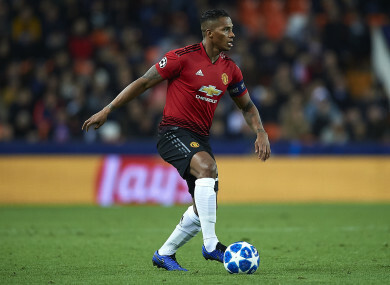 ANTONIO VALENCIA’S EXIT from Manchester United looks imminent, with today’s 5pm deadline for the club to trigger a one-year contract extension fast approaching. The 33-year-old has only featured in five Premier League games for the Red Devils this season, suffering from a loss of form and a string of niggling injury issues. The United captain is not expected to return to action until the end of March, with his current deal set to expire at the end of the 2018-19 campaign. Solskjaer insists he still hopes that Valencia can contribute on the pitch between now and May, but it appears unlikely that his services will be retained beyond the summer. “He’s still not 100% fit, still working to get back fit and he’s had a fantastic career here at Manchester United and England,” Solskjaer told a press conference this morning. Valencia joined United from Wigan back in 2009 and has since managed to win two Premier League titles, the FA Cup, Carabao Cup and the Europa League. The Ecuadorian star has racked up 338 appearances for the club and scored 25 goals, but since the start of the season he has found playing time hard to come by at Old Trafford. Former United boss Jose Mourinho named Valencia as club captain last summer and he was expected to play a huge role for the team this year. However, Ashley Young and Diogo Dalot quickly overtook him in the pecking order at right-back, before Mourinho was dismissed as first team boss in December. Solskjaer, who was appointed in his stead on a caretaker basis, allowed Valencia to keep the captains armband, but he has only featured once for the club in 2019. Email “Man United captain Valencia looks set to leave after 10 years ”. Feedback on “Man United captain Valencia looks set to leave after 10 years ”.